by Chris Woodford. Last updated: March 4, 2019. You often hear people using the phrase "as blind as a bat"—but if bats could talk, would they criticize us for being "as deaf as a human"? We may think we're good at hearing things but our ears can detect only a relatively narrow band of frequencies (sounds of different pitch) centered on the human voice—the sound we most need to hear. Bats, moths, dolphins, and various other creatures can hear much higher frequencies of sound beyond the range of human hearing, which is known as ultrasound. Since scientists discovered ultrasound, they have found all kinds of important uses for it, from medical diagnosis to materials testing and scientific research. Let's take a closer look at ultrasound and how it works. 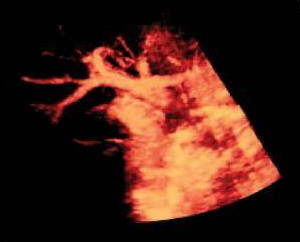 Photo: An ultrasound (echocardiograph) image of a beating human heart. NASA (the US space agency) uses this equipment to study the long-term effects of space travel on astronauts. Photo courtesy of NASA Marshall Space Flight Center (NASA-MSFC). Artwork: Ultrasound (orange band, right) covers the range of sound frequencies beyond human hearing—and higher than the frequencies of everyday sounds, voices, and musical instruments. Human ears can hear sound waves that vibrate in the range from about 20 times a second (a deep rumbling noise) to about 14,000 times a second (a high-pitched whistling); children can generally hear higher-pitched sounds than their parents, because our ability to hear high frequencies gets worse as we get older. 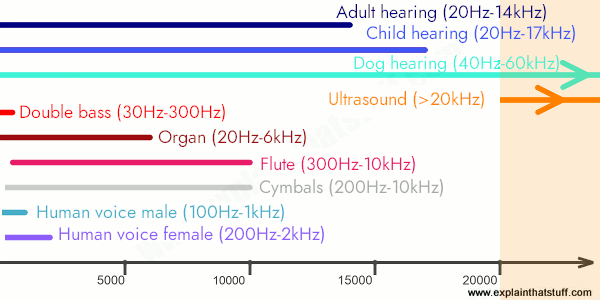 Speaking more scientifically, we could say that the sounds we can perceive have a frequency ranging from 20–20,000 hertz (Hz). A hertz is a measurement of how often something vibrates and 1 Hz is equal to one vibration each second. The human voice makes sounds ranging from a few hundred hertz to a few thousand hertz. Suppose you could somehow hit a drum-skin so often that it vibrated more than 20,000 times per second. You might be able to see the skin vibrating (just), but you certainly couldn't hear it. No matter how hard you hit the drum, you wouldn't hear a sound. The drum would still be transmitting sound waves, but your ears wouldn't be able to recognize them. Bats, dogs, dolphins, and moths might well hear them, however. Sounds this like, with frequencies beyond the range of human hearing, are examples of ultrasound. Photo: Bats like this "see" with sound instead of light. They navigate by sending out beams of ultrasound and listening for the echoes—a technique called echolocation. 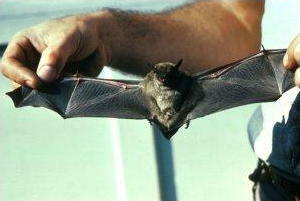 Photo of big brown bat (Eptesicus fuscus) by Don Pfitzer, courtesy of US Fish & Wildlife Service. Note: You might it useful to read our article about sound before you read on. Ultrasound waves have higher frequencies than normal sound waves, but they also have shorter wavelengths. In other words, the distance between one ultrasound wave traveling through the air and the one following on behind it is much shorter than in a normal sound wave. This has an important practical effect: ultrasound waves reflect back from things much better than ordinary sound waves, and that makes them very useful indeed. It's impossible for us to make ultrasound the same way we make normal sounds—by hitting and blowing things, as we do, for example, in musical instruments. That's because we can't hit and blow things fast enough. But we can make ultrasound using electrical equipment that vibrates with an extremely high frequency. Crystals of some materials (such as quartz) vibrate very fast when you pass electricity through them—an effect called piezoelectricity. As they vibrate, they push and pull the air around them, producing ultrasound waves. Devices that produce ultrasound waves using piezoelectricity are known as piezoelectric transducers. Piezoelectric crystals also work in the reverse way: if ultrasound waves traveling through the air happen to collide with a piezoelectric crystal, they squeeze its surface very slightly, causing a brief burst of electricity to flow through it. So, if you wire up a piezoelectric crystal to an electric meter, you get an instant ultrasound detector. Artwork: How ultrasound is made for cleaning things. 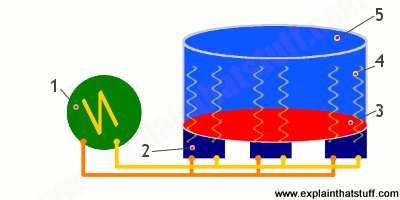 1) A high-frequency alternating electricity supply sends power to three piezoelectric transducers (2). These jiggle about at ultrasonic frequencies, sending their vibrations to a thin, quartz glass plate (3), which transmits waves (4) into a basin filled with fluid (5) into which you place the objects to be cleaned. Using ultrasound for practical purposes is sometimes called ultrasonics—and it's used for everything from industrial welding and drilling to producing homogenized milk and photographic film. Photo: This pregnant woman is watching an ultrasound scan of the baby developing in her womb. 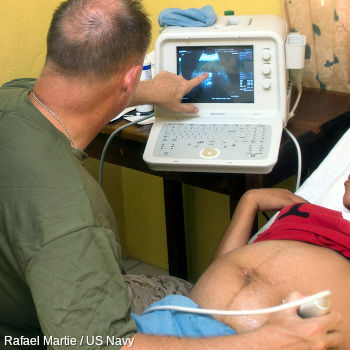 Note the ultrasound scanner (bottom right) being moved slowly across her abdomen, and the monitor (above) showing the picture of her child. Photo by Rafael Martie courtesy of US Navy. Probably the best known example of ultrasonics is medical testing. To save having to open up your body to detect an illness, doctors can simply run an ultrasound scanner over your skin to see inside. The scanner probe often looks a bit like a computer mouse. It has a built in transducer that beams harmless, ultrasound waves down into your body. As the waves travel through the different bones and tissues, they reflect back up again. The same transducer (or a separate one alongside) receives the reflected waves and a computer attached to the scanner uses them to draw a detailed picture of what's happening inside you on a screen. Scans of fetuses (unborn babies developing in the womb) are made this way. Photo: A closeup of a small ultrasound probe. Photo by Rafael Martie courtesy of US Navy. 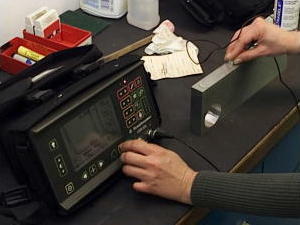 Similar equipment is used to test for flaws in machines such as airplane jet engines. If there's a crack deep inside a metal, inspecting it from the inside won't reveal the problem. But if you run an ultrasound scanner over the outside of the metal, the crack inside will disturb and reflect back some of the ultrasound waves—so the defect will show up on your testing monitor. Inspecting materials this way is sometimes known as nondestructive testing, because you don't have to damage or take things apart to check them out. Photo: Examining an airplane engine using ultrasonic, non-destructive testing. The inspector is moving an ultrasound probe over an airplane component with her right hand. She is adjusting the ultrasound beam with her left hand at the same time. Photo by Michelle Michaud courtesy of US Air Force. Relatively low-strength ultrasound waves are used for medical scans and non-destructive testing. Much stronger ultrasound waves have very different uses. If you have a painful kidney stone, firing powerful ultrasound waves from outside your body can make the stone vibrate and break apart. Strong ultrasound waves are sometimes also used to destroy cancer tumors and brain lesions (damaged regions of the brain). In a similar way, ultrasound waves can be used to clean jewelry, watches, false teeth, and a wide range of machine parts that may be too difficult (or inaccessible) to clean in other ways. Another popular use for ultrasonics is in ships, both for navigation and for locating objects underwater. Sound travels faster through water than through air, which is very helpful because light hardly travels through water at all. Most people know that whales can use low-frequency sound to communicate across entire oceans. Submarines use a similar trick with a type of navigation called sonar (sound navigation and ranging), which is a bit like an underwater equivalent of radar. Photo: It takes skill and concentration to monitor a sonar scanning screen. 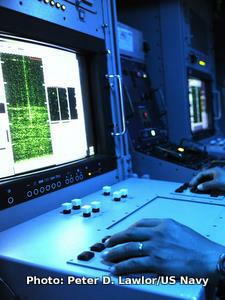 This system is onboard the ship USS Gladiator and is being used to detect mines. Photo by Peter D. Lawlor courtesy of US Navy. How does it work? When a submarine is deep beneath the surface, it can find its way by sending out bleeps of sound and listening for the echoes—just like a bat using echolocation. By timing how long it takes for the echoes to come back, a submarine's navigator can figure out if there are any other ships, submarines, or other obstacles nearby. Sonar is also used by ships to calculate how deep the sea is (or draw a map of the seabed) by firing sound beams straight downward. This technique is known as echo sounding. 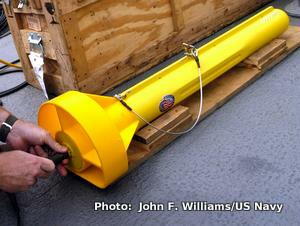 Photo: A typical side-scan sonar towfish. This one uses ultrasound at a frequency of 600 kHz, which is well above the limit of human hearing. Here, it's being hooked up to equipment onboard a scientific research ship before being lowered into the water to be dragged alongside. Photo by John F. Williams courtesy of US Navy. Different sonar systems use a very wide range of sound frequencies, from very low infrasound (which may cause problems for whales and other sea creatures), through audible sound (the classic "ping" noise you hear in wartime submarines in the movies), right up to very high ultrasound (typically used in fish-location systems used by, among others, industrial trawlers). High-frequency sounds are used in side-scan sonar, in which a small, torpedo-like scanning unit called a towfish is dragged behind a ship and sends out wide sonar beams to either side. The beams leave the towfish at angles and reflect back again, producing a profile of a wide area of the sea (and seabed) beneath. Side-scan sonar is used in marine archeology (to locate wrecks on the seabed), ocean research, and plain-old fishing. Different fish reflect sound to a different extent and, with skill and experience, it's possible to figure out from the sonar beam not only which fish are present but how many there are in a certain area. Generally, the higher the sound frequency used, the more detail that shows up, but the shorter the range over which it's effective; higher frequencies are best for detailed work in small areas of relatively shallow water, while lower frequencies are needed for deeper water or long-range detection. Ultrasound (sonogram) A detailed introduction to medical ultrasound scans from MedlinePlus (U.S. National Library of Medicine). NDT Resource Center: A very good introductory guide to nondestructive testing with materials for students of all ages. Includes short online courses in the science of NDT, careers information, and a great deal more. Excellent material. Ultrasound teaching manual: the basics of performing and interpreting ultrasound by Matthias Hofer, Thieme, 2013. A comprehensive introduction to medical ultrasound scanning. Diagnostic ultrasound imaging: inside out by Thomas Szabo, Academic Press, 2013. A very detailed (800-page) guide with more emphasis on theory, but also covering practical applications. Ultrasound Physics and Technology: How, Why and When by Vivien Gibbs, David Cole, Antonio Sassano. Churchill Livingstone, 2009. This is a good first port of call for medical students and sonographers who want to understand the science behind the scans they'll be using. Ultrasound Tracks Therapeutic Microbes Deep Inside the Body by Elie Dolgin. IEEE Spectrum, January 3, 2018. How ultrasound can follow the progress of medical bacteria as they work they way around a patient's body. Ultrasounds Do Little for Broken Bones by Nicholas Bakalar. The New York Times, October 26, 2016. A new clinical trial seems to find that ultrasound does not help broken bones to heal. An Ultrasonic Scalpel for Brain Surgery by Neel V. Patel. IEEE Spectrum, December 26, 2014. A new technique called transcranial focused ultrasound can be used to make precise cuts inside the brain without opening a patient's skull. Vscan handheld ultrasound scanner launched by Fergus Walsh, BBC News, 17 February 2010. Announces the release of a portable ultrasound scanner the size of a large cellphone. Ultrasound to give feel to games: BBC News, 2 September 2008. How ultrasound transducers could be used to give computer games a sense of touch.